An entire metropolis of Murlocian life, a bustling nation which we name "Murlocistan". Rolf's leftovers are sitting in the middle of town, surrounded by high-capacity Murloc condos. 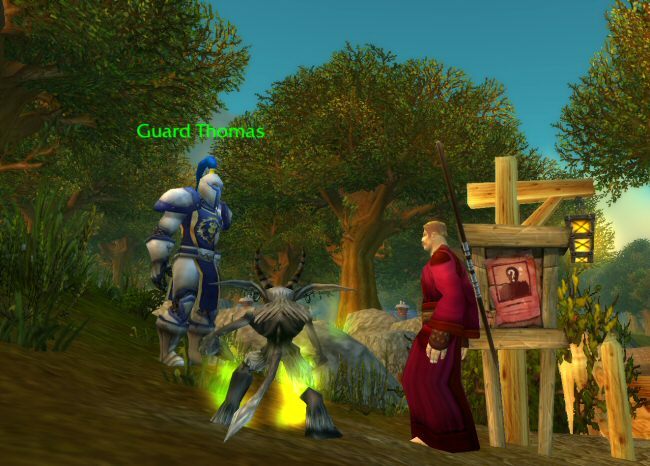 Sure, we could just tell Guard Thomas that his men died hilariously and deliciously in the bellies of a thousand Murlocs, but if we did that then we would miss out on this unique opportunity for Norman to try and feed us both to the Murloc nation. It makes for a very messy conflagration of fire, blood, gurgling, profanity, and tears. "Well, we had to kill fifty Murlocs to do it, but we finally got proof that there are Murlocs in the woods," Norman says, then thinks about what he just said, and then gnashes his teeth a bit. "It's tough, isn't it?" I ask. "I guess," Norman admits. "I mean, it seems simple. People want help. I want to help them. Why does this have to be so hard?" "See, that's your problem. You don't really want to help people. If all you wanted was to help people you could just sell yourself into slavery. Boom. Now you're helping people all day. No, you don't want to help people. You want people to be worthy of help. Welcome to the real world, son. People are bastards." "Not all of them!" Norman protests, weakly. "You've basically been doing Marshal Dughan's job since you got into town. You've saved the lives of the people he's supposed to be guarding while he stood back and taken the credit. And yet, if you were to stand in front of him and burst into flames, do you think he'd even be willing to walk across the room to piss on you?" "I don't know," says Norman, looking at the ground. "Yes you do! You know the truth!" Norman sniffles a little, "I hate being a hero." "C'mon, say it. How do you feel about Marshal Dughan?" "I HATE HIM!" Norman screams at last, before he breaks down sobbing. "There you go, buddy. Let it all out." We get back to Guard Thomas and Norman turns in the medallions. Thomas then thanks him. "That's it?" says Norman. "Thanks? Is that all you're going to do?" "Oh, right," the guard says, "Here's an armor marker. Take it to the Eastvale Lumber camp and redeem it for a free piece of armor." "But what about your report? The Murlocs? Are you going to turn it in? Are you going to send troops? 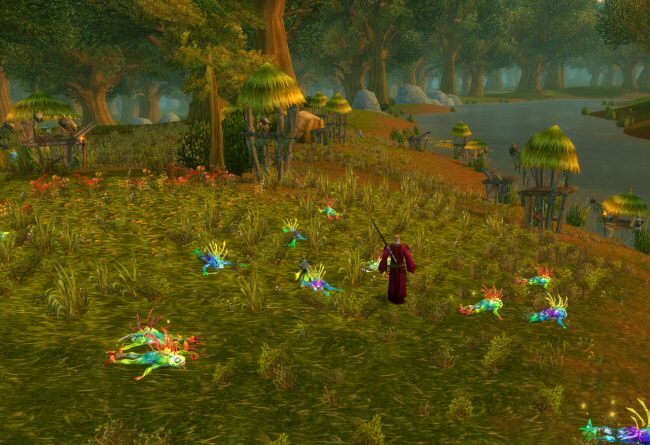 According to a guy in Goldshire, these guys have attacked merchants. You lost two guards." Guard Thomas gives this little shrug, "Enjoy the armor, citizen." Yup. That's the end of the quest chain. Kind of odd. There's no closure. You're asked to look into the Murloc problem and you never go back to Remy or Dughan. Although, I guess the Murloc bounty sort of counts as you doing something about it. "Oh, and while you're in the logging camp ..." Guard Thomas adds. 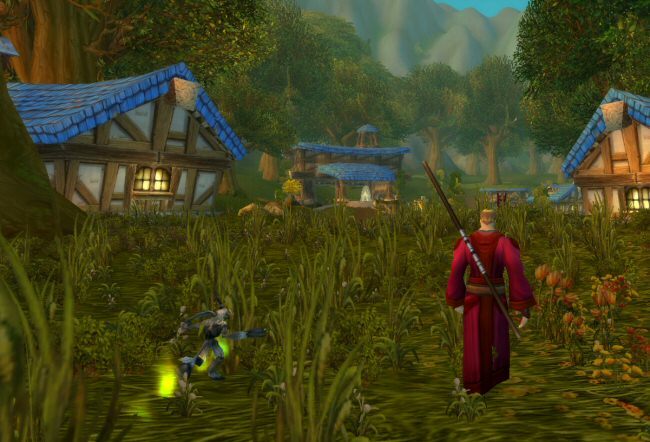 "Wild animals are growing more and more aggressive the farther we get from Goldshire, and the Eastvale Logging Camp suffers nearly constant attacks from wolves and bears!" "That sounds exactly like the sort of thing you should mention in YOUR REPORT TO DUGHAN." "Anyway. If you could kill eight wolves and five bears, that would really help," Guard Thomas says before turning back to watching the road. "Stupid guards," says Norman as we walk towards the camp. "I think they cause more problems than they solve." "Your parents were paladins. You have no room to talk." "I never said my parents were paladins. Just mother. In fact, dad was a Warlock." "Ohh! This is good. So dad was a warlock like you, eh?" "Well, not like me. From what I gather he was a regular warlock. Evil and such." "So how did those two end up having you? Wait, let me guess: Mom was into the whole 'bad boy' image and at the same time she thought she could 'save' him from evil. That's always a good one." "I never asked, to be honest." "Or maybe daddy was attracted to strict women in chainmail corsets. Like, maybe he was into-"
"I certainly wouldn't know anything about that side of things!" he says. "Well my money would be on your dad wanting a good-"
"And I don't want to know, thank you!" "Okay, fine. Take it easy. Just trying to give you a proper education." NEXT WEEK: What? More work?